변하지 않는 가치를 추구합니다 . 우리들은 무엇인가 약속이나 믿음을 확인하는것을 좋아합니다. 믿음을 기억하는 방법중 하나가 문자를 이용해서 적어놓는 것입니다. 반지에 자신 혹은 상대의 이름을 새겨넣는것은 어떤 의미를 가질 수 있을까요? 서로의 관계를 확고히 하고, 믿음을 재확인 하는거겠죠. 반지에 서로의 이름을 새길때의 [사랑했던 순간]만큼은 변하지 않을테니까요. 시간이 흘러서 사랑이 식는다해도 반지에 새겨진 이름은 [사랑했던 순간]을 떠올려 주겠죠. [사랑했던 순간]을 영원히 간직하겠다는 약속입니다. Pursuit of a value does not change. What is an appointment or to confirm the belief that we'd like. Faith in any way, and one of them is trying to remember to write down the characters. To put on their own or the opponent's name engraved ring can have any meaning? Strengthen their relationships to each other, and to reaffirm faith would put Engrave the names of each other in the ring, a lot has changed, even if the moment when love was not enough change, because After all this time, love cools recall the moment who loved the names engraved on the ring will show. 심플한 디자인일수록 서체와 내용의 중요성은 커집니다. 이니셜반지에 새겨지는 문구는 다양합니다. 가장 많이 새겨지는 문구는 두사람의 이름입니다. 반지에 새겨진 두사람의 이름은 영원합니다. 항상 손가락에 껴있는 반지를 보면서 부부의 의미를 되새기게됩니다. 다음으로 많이 새겨지는 문구는 좋은 글귀나 명언입니다. 마음 깊이 새기고 싶은 좋은 글귀를 반지에 새긴다면 꼭 이루어질 것 입니다. The various initials engraved ring phrases. 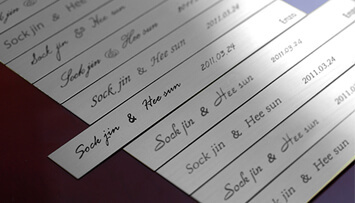 The names of the two people most often engraved stationery. 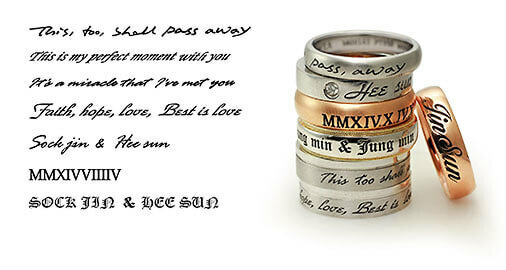 The names of the two people is forever engraved in the ring. Always looking for the ring finger are reminded that cuddling on the meaning of the couple. 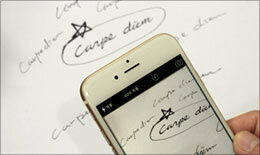 The following is inscribed with a lot of good uptake and sayings phrases. 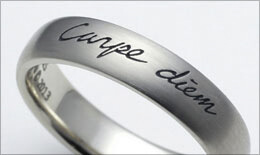 This means that if you made ​​a good inscription engraved on the ring you want to carve my heart. 반지의 겉면에는 두분의 이름이 새겨지거나 의미있는 문구 혹은 기념일등을 새기는 경우가 많으며, 반지의 안쪽에는 두분의 이름과 기념일등이 새겨지는 경우가 많습니다. 대부분의 이니셜반지는 심플한형태를 하고 있습니다. 형태가 단순할 수록 반지에 담긴 의미는 더욱 빛을 발합니다. 다이아몬드를 가장 돋보이게 하는 반지의 디자인이 심플한 디자인이듯 이니셜반지또한 심플한 형태에 멋스럽게 새겨진 이니셜은 반지의 가치를 더해줍니다. 이니셜반지에서 신중한 서체의 선택은 반지디자인의 전부라고 할 만큼 중요한 비중을 차지합니다. We are the most simple form of initial ring. This means more light to be put in the ring is more simple form. Design of a diamond ring to complement the simple design makes this seem more the value of the initial ring ring engraved initials are also tastefully simple form. 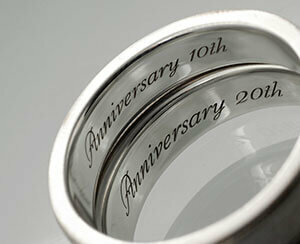 Occupies a significant portion of the ring design is all enough to select the font from the initial ring is prudent. 한문 문화권의 전통을 가지고 있는 아시아 국가뿐 아니라 상형문자의 아름다움을 보여주는 다양한 한문서체는 품격과 멋을 더해드립니다. 정자체와 흘림체로 새겨지는 다양한 서체로 내용의 전달과 더불어 그 의미도 더욱 깊게 새겨집니다. 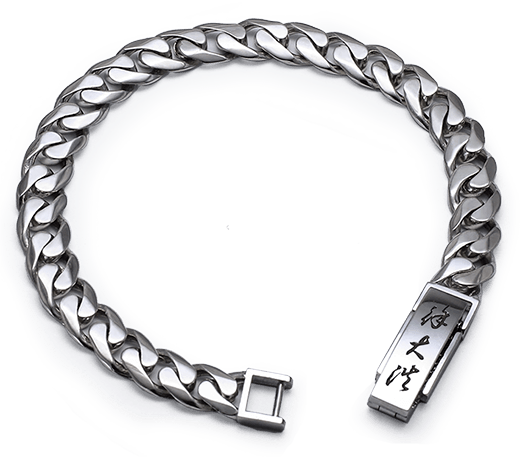 Asian countries as well as with a variety of traditional Chinese culture, Chinese calligraphy, showing the beauty of the hieroglyphs we will more refined and stylish. 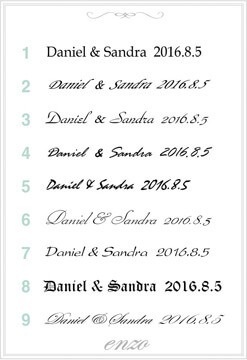 PRINT and engraved with Cursive, along with the delivery of content in a variety of fonts that are inscribed deeper meaning. Show the beauty of classical Chinese seen as attractive in the English culture. 이니셜은 '직접 손으로 쓴 서체'를 반지에 새기실 수 있습니다. 서체에 자신이 없으시다면 새겨질 내용을 말씀해주시면 엔조에서 도안해서 보내드리고, 그 중에서 가장 마음에 드신 서체를 선택하면 됩니다. The initials "written by hand font, you can ring in the new air chamber. 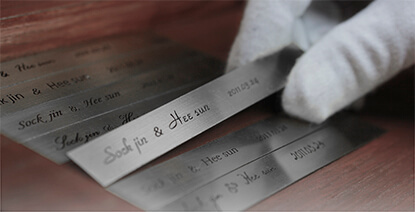 If you own typeface eopeusi Please mention we'll send the information to engrave designs on the Enzo, among them, you can select the font you like it best. 1. 새길 내용을 종이에 써봅니다. 2. 가장 마음에 드신 서체에 표시를 하고 휴대폰으로 촬영하여 메일이나 메신저로 전송해주십시요. 3.손으로 쓴 서체 그대로가 반지에 새겨집니다. *반지의 겉면이나 안쪽 모두 가능합니다. 1.새기실 내용을 메일이나 메신저, 문자메세지로 말씀해 주십시요. 2.말씀해 주신 내용을 여러가지 서체로 작업하여 전송해드립니다. 3.가장 마음에 드시는 서체를 선택하시면 반지에 새겨드립니다. 1. Please tell us a new air chamber information by e-mail and instant messaging, text messaging. 2. 'd tell me who sent the contents to work with various fonts. 3. 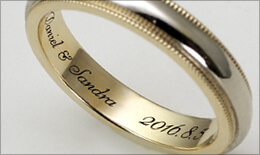 If you select the font you enjoy the most heart will be engraved on the ring. * Available both inside and outside of the ring. *6번 서체를 선택하여 반지에 새긴 예시입니다.